On January 20, 2016, the so-called “conspiracy theorist” Alex Jones released his land-mark 56-minutes interview with the most hated Afro-American by the Jewish Lobby, Louis Farrakhan, the leader of Nation of Islam. Alex Jones aired the interview in four parts with the tile: Louis Farrakhan: Angel or Devil?. Listen to the interview below. Personally, I’m not a reader of Alex Jones’ InfoWars.com. But I have heard of him being called Crypto Jew. His ex-wife Kelly Jones, a mother of three, is said to be Jewish. Some even claim that Alex Jones is promoted by no other than Farrakhan’s greatest enemy, Abraham Foxman, former head of ADL and country’s highest-paid Israeli lobbyist. 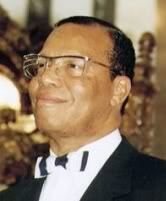 Alex Jones called Farrakhan as the second most influential Black person in America after president Barack Obama. He also said that Farrakhan is among the world’s top 100 most influential Blacks in the history. Farrakhan answered Jones’ questions ranging conspiracy to the shadow power ruling America, the country’s future, US war on terror, US foreign policy in the Middle East, Libya, Donald Trump, division within Black communities, and racism against non-White minorities. An edited transcript of the interview can be read here. On January 17, 1996, Farrakhan took a 27-day trip to 23 African and Middle East countries including Ghana, Nigeria, Gambia, Libya, Sudan, South Africa, Iran, and Iraq. Farrakhan was condemned for “meeting and lavishly praising some of world’s bloodiest and antidemocratic nations and their terrorist-supporting leaders,” by Abraham Foxman, then racist head of ADL. In reality, those “bloodiest and undemocratic” nations with the exception of Iran had diplomatic relations with Russian-US Foxman’s adopted country and some of them were even supported by Israel. Ironically, during that time, the Jewish army under the command of the Butcher of Beirut Gen. Ariel Sharon was busy killing and terrorizing civilians in southern Lebanon. In September 2015, America’s top Jewish scholar Dr. Noam Chomsky said that it’s US and not Iran that poses threat to world peace.